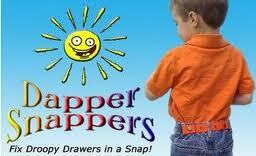 *TI was so excited when we got the opportunity to review Dapper Snappers. We have been struggling for years trying to find a solution to keeping Andrew's pants up. He is very thin and as he is getting older most of the pants no longer have the adjustable waist bands. Even when he would play baseball with a belt on his pants would sag and sometimes slip down. •Perfect for kids who are in between sizes or wearing hand-me-downs! Dapper Snappers has very generously offered a $25 gift certificate to Dappersnappers.com to one of our readers! 1.Tell us what you love about Dapper Snappers! Giveaway will be open until February 1, 2011 at 11:59PST. Winner will be chosen via random.org. Winner must have a US shipping address. Winner has three days to respond before another winner is picked. Memememememe. I want to win!!! I am tired of my skinny boy's droopy drawers!!! I am off to follow Dapper Snapper on Twitter now!! My favorite thing is that they hold up kid's pants, so I will finally be able to use all of the super cute jeans sitting in my lady's closet! What's not to love? I would love to win these for my nephew. He is so small and all his little britches are falling down all the time. My sister puts belts on him but he's 5 and doesn't wanna deal with that all the time. Poor little guy. Like Dapper Snappers on FB.